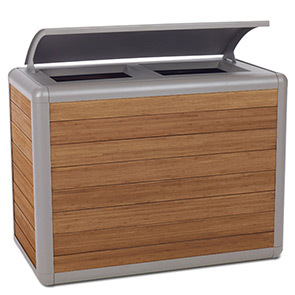 Maintain clean, inviting environments with stylish 70 gallon Beacon Hill bamboo waste receptacles. Developed with a large capacity, one-piece lid, 2 individual disposal openings and liners, Beacon Hill can be utilized as a trash only receptacle or two-stream recycler. The one-piece lid options conveniently lift off for easy routine maintenance of both 35 gallon high density polyethylene liners—available in a built-in tapered bonnet or open top pitch-in lid. 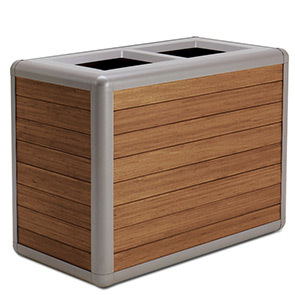 Stylish, sustainable and long lasting, these high volume receptacles are composed of horizontally or vertically placed 1" x 4" bamboo planks tied together by an 11-gauge powder-coated aluminum frame. Bamboo offers 20% more stability in climate-temperature changes than other timber and Engineered into planks using only low V.O.C. adhesives, the UV-resistant stained exterior bamboo has a 'Class A' fire rating.